PHP Scripts Mall steps to launch the new MLM mobile app for the investors to invest the amount in profitable Investment MLM Android Application, which is the traditional MLM software with an outcome of investors to gain daily profits and level bonus etc, it is also known as the Best Revenue MLM Model App. These MLM Android apps for Investment	are the most used plan in the world by multi-level marketing companies.The Investment plan we provided is very easy and basic to understand. Precisely, with our Investment plan, the distributors can with ease counterpart the success and completion of the heads. This is considered to be the best way of accomplishing their networking business with mobile-friendly customization. The MLM Mobile App for Android has three steps of registration process as basic step registration where the new users can register their accounts details and sponsor id, personal step registration like the name, address and personal details etc, the membership registration is that the users have to select their membership plan and the amount to invest. After the successful registrations, the users can login to the system, where they can find the profile details with images, name, sponsor id etc. This Investment MLM Apps for Android has the different user-friendly MLM functionality like genealogy, transactions, investment, and amount withdrawal etc. In the genealogy functionality, the user can able to manage their network-level users and wallet balance amount, in the transactions functionality the user can see the clear display of the amount transactions like amount credited or debited to the user account. In the withdrawal functionality, the user can withdraw the amount by sending the withdraw request to the admin. 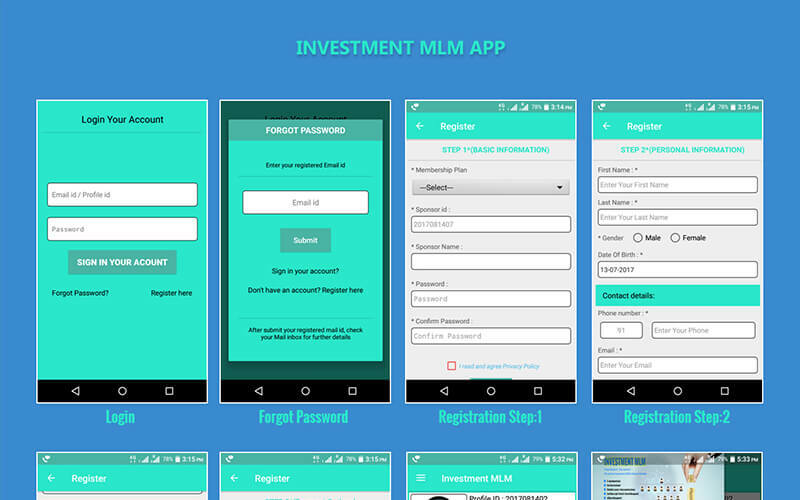 In this Investment MLM Android Application the admin has the major responsibilities to manage the MLM investor management, transaction management, amount withdraw management, referral management etc. The admin has authority to grant permission for the users to join in the MLM investors, approve the user’s amount withdraw request etc. The admin can also get revenue by adding more level of users in the network and also get the referral bonus for the users, while the new users signing up the account using the sponsor id. We are sure that this MLM Android app for Investment will help you to start your own MLM profitable business without any guide lines or steps. All the transactions and investments reports are detailed viewed by the user. In the user profile,the user can view and manage all the invested amount, level bonus, wallet balance and withdraw the amount in clear dashboard for the easy accessibility. PHP Scripts Mall is more than 16 years experience in the field by delivering the right products and services to the clients around the globe based on the user requirement. Membership plan, Profile management, investment management, Transaction management, Genealogy, 3 Steps of registration, Withdrawal management. Better go with this… right business application for those who likes to invest on a daily basis. Finally got an application based on my need and fulfilled with it from your side.